Complete the following form with as much detail as possible to receive a custom quote and an idea of our current waiting list by email. 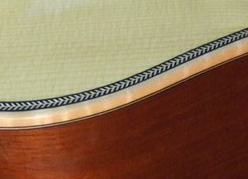 Like our guitars, all quotes are made by hand and so we may take a few days to respond. This form has recently been simplified to only include details which affect the price. Should you proceed with an order you'll be asked to complete a more detailed spec list. Hardware prices listed are generally out of our control and are subject to change without notice. Key: £POA = Price On Application. We may need further details such as drawings to provide a quote, or we may have to contact a manufacturer for custom hardware pricing. Full Name: • Fields marked • are mandatory. Email: • Check that your email address is correct! We can also copy a neck profile from a guitar that you own. 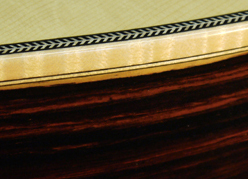 Here a Black/White/Black line adds definition between the Cocobolo sides and Flamed Maple binding. 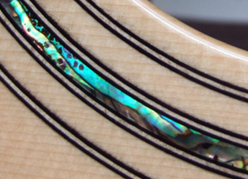 Here multiple Black/White/Black rings adds definition to Abalone purfling.